Add water, peas, garlic, scallion, pimento berries, salt, and seasoning in a pot and cook. Let cool, and then partially drain liquid leaving about a quarter cup; place into a blender, along with olive oil, and blend until creamy. Refrigerate. Place everything into a food processor and chop until it becomes a paste. 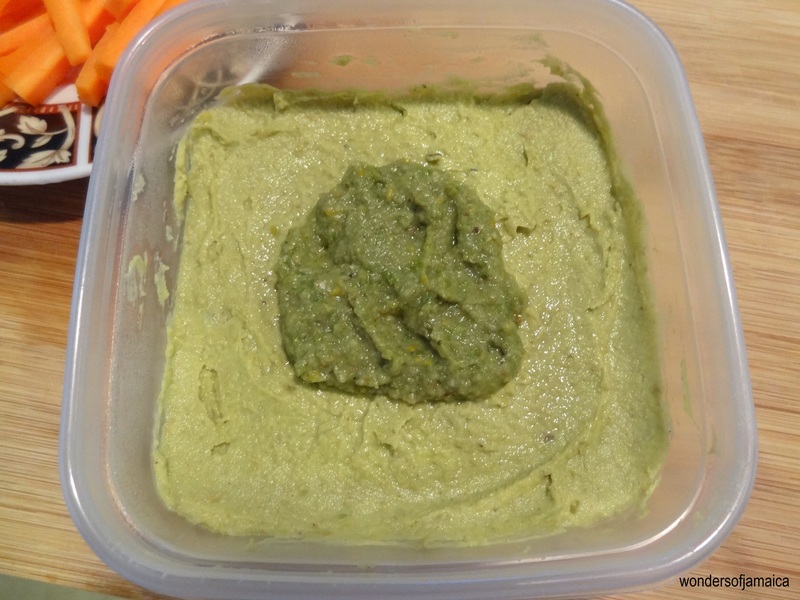 Place Gungo Pea Hummus into a serving bowl, then add Scotch Bonnet Paste in the center. This is a healthy recipe and can be enjoyed with: carrots, celery, chips, and apple or as a spread on pita bread or crackers…just about anything your heart desires. Enjoy and make it a healthy one. This entry was posted in Healthy Eating, Healthy Living, Jamaica, Jamaica Vacations, Recipe and tagged dinner, Food, Healthy eating, healthy living, Hummus, Jamaica, Olive oil, organic, Pea, scotch bonnet peppers, Tablespoon, Travel and Tourism, vegetarian. Bookmark the permalink.